AphroChic bloggers and designers Jeanine Hays and Bryan Mason along with Lonny co-founder and photographer Patrick Cline take you into homes where cultural, global décor breathes beauty and soul into contemporary interiors. Whether you love to source pieces from your travels or simply wish to evoke the destination of your dreams, Remix shows how bold color, unique patterns like ikats and suzanis, original art, and handcrafted furnishings and accessories can help you express your cultural experiences in stylish, unforgettable rooms. With a foreword by HGTV Design Star Danielle Colding, Remix is both a striking object for your shelf and a book that restores meaning to the idea of “eclectic” decorating with genuine, personal style. JEANINE HAYS and BRYAN MASON are the couple behind the popular home decor brand and blog AphroChic, which has been featured in the New York Times, Elle Decor, Lucky, Huffington Post Black Voices, Apartment Therapy, and Decor8. Hosts of HGTV's Sneak Peek with AphroChic, they are also contributors to AOL’s Homesessive and Houzz.com. 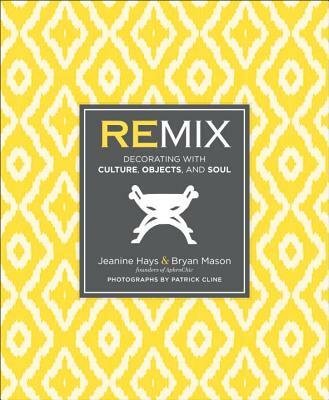 "Aficionados of color, pattern and style--and who isn't?--will LOVE Remix! Here are TONS of inspiring ideas to add personality and pizazz to your home."